Distinguishing characteristics: A small and unassuming looking man, mean facial expressions. Group affiliation: The Fedayin, a hierarchical order of assassins he founded, [CONTENT REDACTED UNTIL WILDFIRE MEETS THE SMOKING MIRROR]. Skills/abilities: Through his years of study, he was able to divine a method for communicating with parties in the future using hashish burned in an azizium-lined hookah. With great effort, he could temporarily take over the bodies of his own descendents in the future using this method. He kept a meticulous record of all of his communications with his operatives throughout possible timestreams in a massive library, encoded in his own personal shorthand. An accomplished martial artist, he was a master of a form of judo that benefitted from a minimum of motion, personally overseeing the training of thousands of his "fida'in" or Fedayin operatives. A disturbingly effective administrator, he maintained records on tens of thousands of operations and operatives at a time, deftly managing an organization in multiple countries, dimensions and timestreams. He could quote the Qur'an by heart, as well as being able to quote extensively from the texts of most Muslim sects. He had the equivalent of a doctorate in philosophy, and was well versed in mathematics, astronomy, alchemy, medicine, architecture, and the major scientific disciplines of his time. He was also a master magician, capable of creating illusions and doing extraordinary feats of sleight of hand. Brief personal history: Born to a Yemenite father in a family of Twelver Shi'ah, Hassan was a playful and energetic child prior to his family moving to Rayy (modern Tehran) when he was nine years old. There, on his way to the marketplace one day, young Hassan saw a court magician with a huge staff toss the stick to the ground, where it turned into a serpent. With a word, the snake was a staff again, and the magician allowed the gathered children to touch it, most adults being too superstitious. Hassan was entranced by the power the man had, and asked, "how could I become like you?" The magician winked at Hassan's parents and said, "Study hard and Allah will show you the way." From that moment on, Hassan's life was consumed with study, particularly focusd on palmistry, languages, philosophy, astronomy and mathematics (especially geometry). In traipsing back and forth to local libraries, he met Amira Darrab, and became entranced by Isma'ili or Sevener Shi'ah missionaries who were based in Rayy. These missionaries were supported by the "da'wa" or "mission" of the Fatimid caliphate of Cairo, a powerful and supportive religious body that regularly financed expeditions to bring the Islamic faith to supposedly wild lands outside their influence. At age seventeen, Hassan converted from Twelver Shi'ah and swore allegiance to the Fatimid Caliph, studying under Darrab and Abu Najam Sarraj, another local da'iiyayn (missionaries) academic who had come to shore up the mission's dogmatic underpinnings. Hassan studied alongside the famous Islamic poet Omar Khayyam, whose learning Hassan respected but whose "softness" and sole focus on study made Hassan begin to study martial aspects as well. In pursuit of this goal, Hassan traveled to Cairo and stayed with Resi Abufasi, a friend of Hassan's father from Rayy. Abufasi was a military man who kept a scimitar by the front door of his home, and under Abufasi's tutelage, Hassan became a great swordsman and tactician, his knowledge of geometry serving him well. Hungry for greater experience, Hassan traveled through Albania, Armenia, Damascus and Palestine before returning to Egypt to complete his studies and be named a da'iiyayn. After a political snafu where the chief of the army Badr al-Jamali had Hassan imprisoned for publicly supporting the son of the imam as the next for that role, Hassan began to become disillusioned with the organization. He played the role of the faithful missionary, but began to create plans of his own. Hassan traveled through Persia, doing the work of a missionary and following up on rumors he'd heard of a magical element that could help a man see the future. His missionary work was resisted by Turkish overlords, anxious to annex Persia, and Hassan sent the rest of his missionaries off as a diversion and traveled deep into the mountains where he befriended another outcast, a Christian named Datyous. 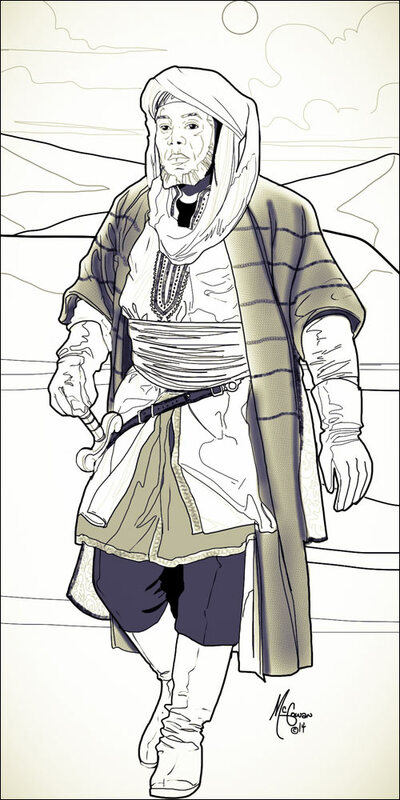 Datyous, a native of the mountians, was an anomaly in the area, believing as none others did, and his bravery inspired Hassan. Datyous had heard the rumors and led Hassan to the castle of Alamut, abandoned and in disrepair. According to legends, the castle had been built in 865 by a king who had a vision of eagles perching, and strove to stand among them. Exploring the castle, Hassan found the secret -- beneath the great bedchamber of the king was a tunnel, and below that was a vast mine which was one of the world's only sources of a rare reddish element that came to be known as azizium. The only other known source of azizium on earth was the forbidden kingdom of Kunganchi. Azizium had an unusually high atomic number -- 187 -- and was stable through a rare quantum state that gave it unusual properties. Realizing the treasure he'd found, Hassan slew his friend Datyous and began to grab azizium. He went back to the king's bedchambers and saw a hookah pipe, lined with the unusual material. Taking some hashish from Datyous' pack, Hassan smoked through the azizium hookah and for him, everything changed. Hassan left the fortress of Alamut for the last time in his life to summon his faithful men to him. Within weeks, the mission had converted most of the towns in the area and secured a power base for Hassan. He remained in the fortress for the next 35 years, twice venturing to the roof to see something he would not share with his followers. Slowly exposing some of his more faithful and higher ranking devotees to azizium-laced hashish smoke, Hassan's men became more devoted and more fanatical, bringing back volumes of sacred texts, arming the fortress and suppressing opposing elements. In the secrecy of his study, he expanded the uses of azizium to communicate through hashish smoke with parties in the future, beginning the amassing of his vast library, with stories of days yet to come.